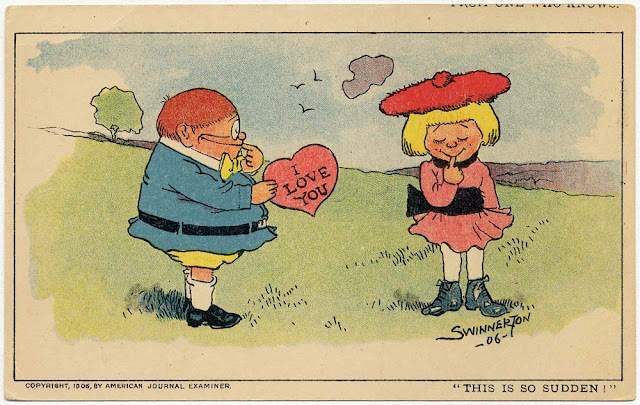 Another in the series of Hearst newspaper giveaway postcards, this one by Jimmy Swinnerton was a freebie distributed with the Boston Sunday American in 1906. I have some of the Hearst cards in their pristine condition, that is, on a large card of four post cards that must be cut out. The bottom of this card tells that it is a special supplent to whatever Sunday paper in the chain that was offering it. As I've somehow never encountered an ad or poster or anything announcing these cards, I've never known what exact week they might have been issued. My theory is that they were just printed up and then one stuffed inside so many issues until the stock ran out, and they'd be a surprise for the reader. Any thoughts? When going through Hearst microfilm, it is entirely possible that I encountered ads announcing these inserts. Unfortunately, even if I had the wisdom to take notes on the phenomenon, those notes would be buried under the infamous vast leaning towers of paper here at Stripper's Guide World Headquarters.